Expansion of the Social Security disability program continues in the news. 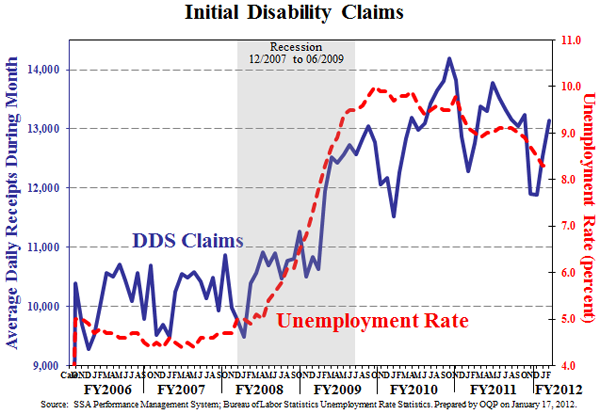 Every week it seems some headline decries the number of beneficiaries added to the Social Security disability rolls. In fairness, and as I have previously blogged in earlier entries, the number of individuals receiving disability payments is on the rise. Moreover, it is also true that actuarial accounts indicate that the payment system will exhaust its surplus in about twenty years, or less given some projections. The Disability Insurance Trust Fund is set to run out in 2018. Seventy-five percent of claims can be paid with current payroll contributions after that set period. Still, figures show that more than 80% of administrative law judges approve about half of the claims brought into their tribunal. The percentage number of claims approved overall has actually fallen. Still, with baby boomers reaching age 50 and more women having earnings credits to qualify for disability, and with states pushing unemployment recipients to apply for federal benefits, the number of applications is continually growing. Even with controls in place to cut down on excessively generous awards, claim benefits are on the rise. Reform measures have included doing away with the administrative law judge review; tougher review of applicants; and cutting program benefits.